Dr. Tannaz Rastegar Lari, DDS, MSc. Dr. Tannaz Rastegar Lari has been working as an Orthodontist for the past 8 years, in the UAE. She is currently working with Thumbay Dental Hospital. 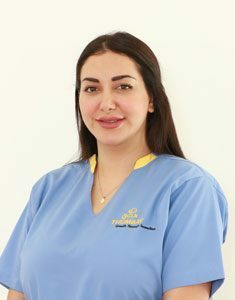 Following her DDS in 2004, Dr. Tannaz Rastegar Lari pursued postgraduate studies and earned her Master’s Degree from the European University College Dubai in 2011. She successfully completed advanced certification in orthodontics from Malmö University in Sweden in 2011. Dr. Tannaz Rastegar Lari has many years of experience in assessment, diagnosis, and treatment of dental problems in children, teens, and adults. She is specially trained to design appliances that align teeth, produce and maintain their normal function while at the same time improving facial esthetics. At Thumbay Dental Hospital, She offers her patients a variety of treatments. She is a certified provider of Invisalign and Incognito braces.